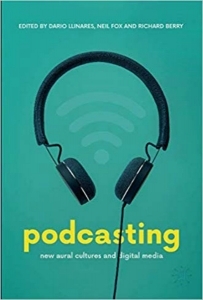 In Podcasting: New Aural Cultures and Digital Media, editors Dario Llinares, Neil Fox and Richard Berry offer an interdisciplinary collection that explores the topic of podcasting through a media and cultural studies lens. Kim Harding welcomes this scholarly introduction to an emerging area of enquiry that will hopefully open up avenues for deeper appreciation of this new aural culture. Podcasting: New Aural Cultures and Digital Media. Dario Llinares, Neil Fox and Richard Berry (eds). Palgrave. 2018. Scrolling through Twitter recently, one particular quip summed up my latent prejudice about podcasting. ‘When will we have the technology to develop a podcast with male and female hosts?’ it joked. 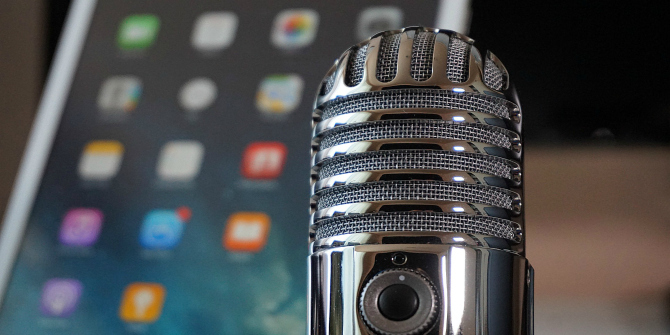 With such names as David Tennant, James Smith, Joe Rogan and Paul McKenna currently riding high in the iTunes UK charts, it’s somewhat easy to assume that podcasting is something of a ‘guys talking about stuff’ genre. However, with the number of podcast listeners doubling in the past five years, to 11% of the UK adult population, it is clear that podcasting is coming of age, a ‘teenage medium’ that is still asserting its identity (29). Although it has been in existence since 2004 – its name coined by Guardian writer Ben Hammersley, who was seeking a term for the ‘new boom in amateur radio’ – it is curious that this particular aural culture has not received much scholarly attention. Therefore, Podcasting: New Aural Cultures and Digital Media is a timely collection of essays that seeks to address this gap, with a volume that will appeal not only to students of media and cultural studies, but also to anyone interested in the short history of this medium and its place in wider culture. Editors Dario Llinares, Neil Fox and Richard Berry blend criticality with a self-confessed element of ‘fandom’ – to this end, Llinares and Fox have been producing a podcast called The Cinematologists since 2015. For them, podcasting is not just a highly enjoyable outlet for discussing their love of film, but also a conduit for ‘a reinvigoration of the dialectic’ (2), engendering new ways of exchanging ideas outside of the written form of the academic journal, with podcasting’s open-source ethos acting as a force to challenge the structures of academic publishing (3). This volume is what they claim to be the first comprehensive interdisciplinary collection of academic work on the topic of podcasting ‘within a media and cultural studies lens’. The volume weaves together diverse perspectives, drawing on the work of early career researchers alongside audio and creative practitioners. While some chapters focus on podcasting’s commercial aspects, such as production culture and syndication (57) or the ‘aspirational labour’ of podcast amateurs (36), other chapters explore this developing vehicle for drama and the creative possibilities it affords. Farokh Soltani’s consideration of the dramaturgy of podcasting and its potential to reconceptualise the creation of drama with sound alone, breaking from the radiophonic models that preceded it (189), lends weight to the editors’ belief that podcasting is not another iteration of radio, but much more than that – a practice of cultural work that spans drama, performance art, criticism and education (5). Although each chapter sheds light on this previously sparse area of scholarly enquiry, the strength of the collection lies less in its analyses of the commercial background to the podcasting industry and more in its employment of the medium to explore wider social themes and theoretical approaches. For example, Lukasz Swiatek’s inquiry of the podcast as an ‘intimate bridging medium’ (177) posits the practice as a route to overcoming divides between forms of knowledge and disciplinary boundaries. In this, Swiatek draws on Robert Putnam’s seminal Bowling Alone, contending that podcasting builds ties between social groups and generates ‘bridging capital’: a form of social capital that does not perpetuate inequality, as argued by Pierre Bourdieu, but rather acts to strengthen civic life (180). Llinares’s chapter on podcasting as ‘liminal praxis’ stands out above all others in this collection. Here, Llinares reflects on his own status as an amateur podcaster and considers the affordances of podcasting not only as an arena in which he can talk about his love of film, picking up a range of technical and media skills along the way – such as sound production and social media marketing – but also as a means by which to carve out a space for academic discourse (124). Indeed, podcasting has come to frame how he regards himself as an academic, the medium being a ‘profoundly valuable’ approach to understanding mediated subjectivity (136). Through this, he conceives of podcasting’s value as ‘a primary method of research dissemination’ (141), an archive of audio data that can help address disciplinary silos in the academy. Podcasting, Llinares contends, can be regarded as ‘a kind of positive destabilisation; an exciting and potentially revelatory disruption of the boundaries that tie disciplines and fields of inquiry to specific forms of expression and institutional norms’. This liminal praxis, described as an ‘ontology of inbetweenness’ (126), is fleshed out by examining the relationships between technology, culture and aesthetics, bringing the ‘nomadic media consumption’ of Michel de Certeau into the mix (127), along with Walter Ong’s concept of secondary orality. This serves to illustrate ‘the communicative possibilities of languages materialised through sound’ in podcasting praxis, destabilising the hierarchy between text and sound (135). The emotional response to sound is also addressed, with Llinares quoting Girls creator Lena Dunham and her excitement in discovering the rich possibilities of the human voice through the podcast, giving her what she calls a ‘new super sense’ in the ‘deep’ experience of listening. For those still wondering whether podcasting really is just ‘guys talking about stuff’, then this volume goes some way to addressing not only hierarchies of text and sound, but gender hierarchies in podcasting too. As well as Llinares’s acknowledgement of discourses around the gendered voice and conceptions of authority (139), Stacey Copeland argues, in her chapter ‘A Feminist Materialisation of Amplified Voice’, for the intimacy of the listening experience through the podcast, using the affective power of sound to engage with the listener and challenge gendered expectations (210). Copeland also assesses the legacy of radio, where female voices are ‘greatly exceeded’ by male ones (214), concluding that podcasting, similar to its ‘radio mother’, has yet to find gender balance. She cites a 2013 report by the UK-based Women in Sound network, which found that just 20% of voices on the radio are female, compared with the 55% female population in the UK. With this plea for greater representation in mind, it feels as though the final chapter – an interview between Fox and comedian Richard Herring – is something of a lost opportunity to give the final word to an underrepresented group from the podcasting world. Although the chapter gives the reader some insight into the creative processes of a prominent podcasting figure, it doesn’t quite stand up against some of the stronger chapters in the book, feeling more like an exercise in fandom than in critical analysis. But overall, it is good to see podcasting getting some recognition in the academic literature, and this volume stands as a very readable introduction to an emerging area of enquiry; hopefully, as its editors wish, it will open up avenues for a deeper appreciation of this new aural culture. Kim Harding is a PhD researcher in the sociology department at Goldsmiths, University of London, where she is researching constructions of identity among non-religious youth and how this is expressed through digital technology. She tweets at @sacralised.